St. Louis County Executive Steve Stenger confers with Councilman Pat Dolan at a Dec. 19, 2017, meeting of the St. Louis County Council. St. Louis County voters approved the tax last year aimed at going to public safety services, such as police departments throughout the county. Some Justice Center employees who weren’t given raises have been speaking at council meetings for months. And the council eventually passed legislation that gave $600,000 worth of raises to certain employees and nurses that work in the Justice Center. 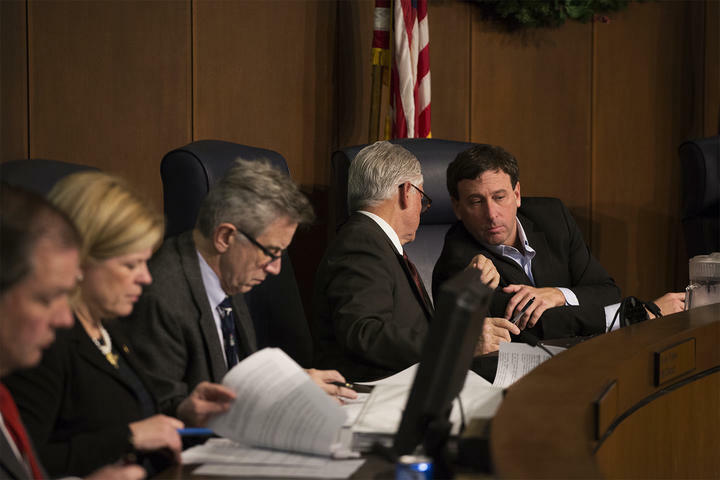 But Stenger said on Tuesday that the bill the council passed is “unenforceable,” because he contended the council didn’t follow the proper procedures. He told reporters that he believes nurses who work in the Justice Center should be paid from the health fund — not from Proposition P.
A number of council members, though, objected to Stenger’s argument. They contend that because nurses work with inmates, they are performing public safety services. “And I don’t understand how it isn’t obvious that a nurse who works in a jail is public safety by definition,” said Councilman Sam Page, D-Creve Coeur. Tuesday’s meeting got especially heated after Councilwoman Hazel Erby asked Stenger why support staff in the prosecuting attorney’s office got raises before nurses. “You have the paid secretaries, accountants and everybody in Bob McCulloch’s office throughout the county who are nowhere near public safety employees,” said Erby, D-University City. Stenger replied that council members went along with those pay increases and should own their decision-making. The dispute over the raises is yet another chapter in Stenger’s acrimonious relationship with members of the County Council. Most of the council members are antagonistic toward Stenger, which means that, depending on the issue, they can go against the county executive’s wishes. With elections looming, tensions continue between the St. Louis County Council and County Executive Stenger. Page told reporters that the council plans to meet next week to override charter amendments that Stenger vetoed. Stenger vetoed a measure that, if county voters approve, would allow the council to have its own legal counsel. Another would allow council members to be independent contractors for government agencies, which is a response of sorts to a controversy over Councilman Ernie Trakas’ legal work for school districts. And Page said Stenger has yet to sign a charter amendment to enact campaign contribution limits in St. Louis County. So if he vetoes that, Page said, they’ll plan on overriding that as well. County and local candidates are not now covered by the restrictions imposed by Amendment 2, to the state constitutional that passed in 2016 and limits donations to $2,600 per election for state or legislative candidates. As a result, county and municipal candidates can accept contributions of any size. But the charter amendment will not place limits on people running for municipal office. That could allow someone running for mayor or city council to raise unlimited amounts of money — and then ship those funds to a political action committee that could help them run for county council or county executive. “I am sure that very bright people will try and find a way to undermine the intent of this amendment, but I think it’s the right next step,” Page said. “I cannot imagine all the hypothetical endarounds for campaign-contribution limits. We’ve seen them at the state level. We’ve seen some at the federal level. And we’ve seen some that we’d never imagined. And I can’t possibly imagine all of those. “But I do think the proposal we hope to place before the voters is the right first step,” he added. Darlene Green first became St. Louis’ comptroller in 1995, making her the most politically powerful African-American woman in the region. 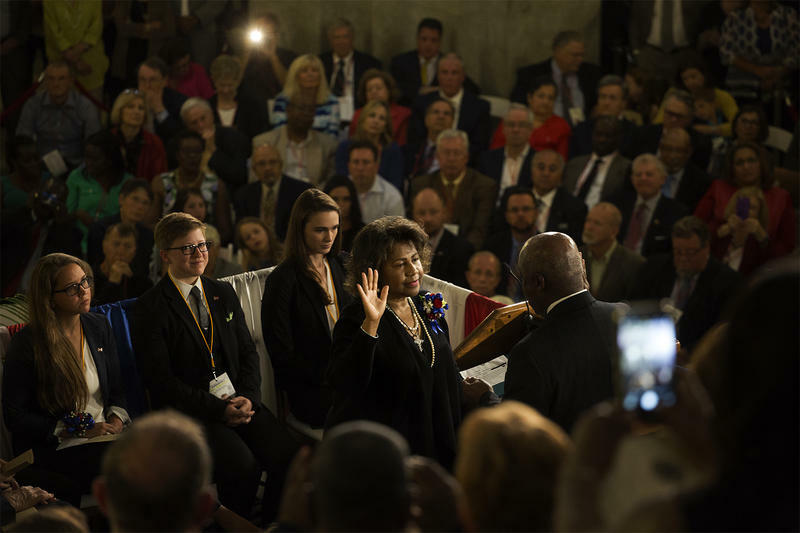 Twenty-two years and seven elections later, she’s still in office, and has lots of company, putting St. Louis on the leading edge of a national trend. 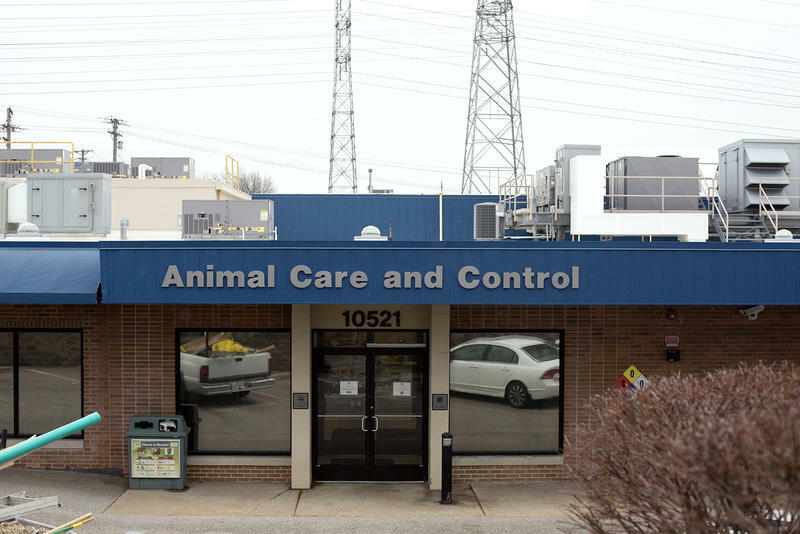 UPDATED March 28 with lawsuit: St. Louis County Executive Steve Stenger says he is committed to an “exhaustive search” to find a new director for the county’s animal shelter. “Racist or discriminatory behavior is not going to be tolerated by this administration,’’ Stenger said in an interview. He declined to be specific, but referred to a hearing that the council held last month on problems facing the shelter. Members of the St. Louis County Council are placing an one-eighth of one cent sales tax on the November ballot to benefit the St. Louis Zoo. 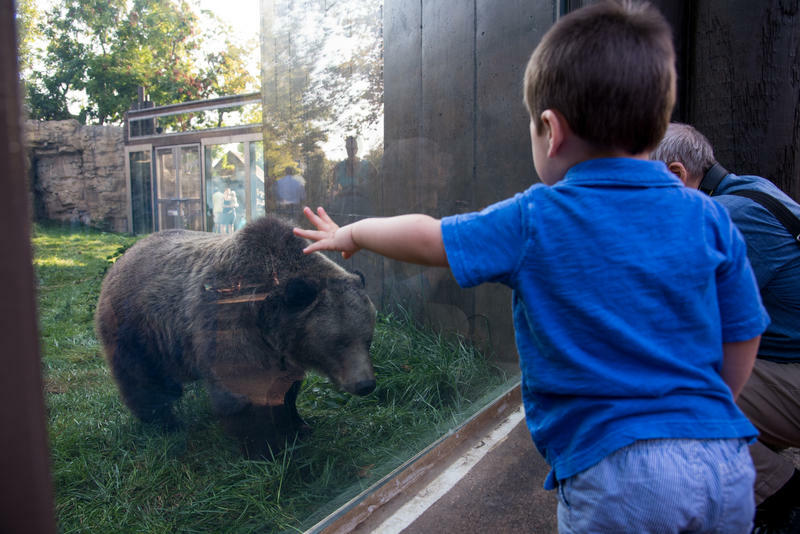 While proponents of the measure believe it could enliven a part of the county that’s struggled economically, others believe it places too much of a burden on residents already shelling out property taxes to fund the zoo.